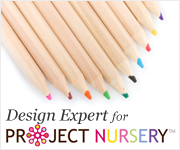 The following are photos from a nursery that Heather designed with us at Sprout. 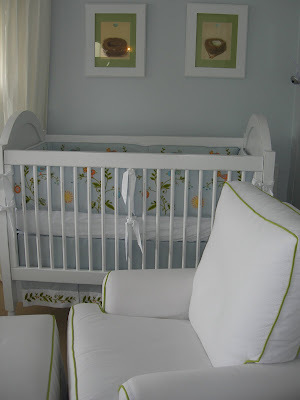 The furniture is from Newport Cottages and the Wren bedding is made by Serena & Lily. 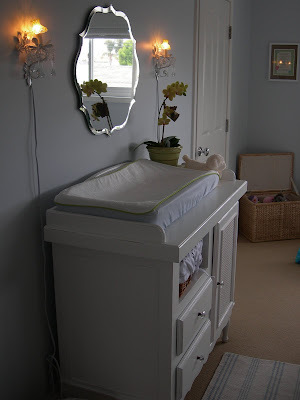 I love her personal touches with the mirror that she chose to put over the changer and the crisp white and green slip-covered glider with matching monogrammed pillow. The color on the walls is Benjamin Moore First Snowfall. My favorite colors are blue and green. I knew that I would use them whether I had a boy or girl. When I saw the Wren pattern by Serena and Lily, I knew that I found what I was looking for. I also love birds and nests, so it was a natural fit. The crib set described above was my first purchase. Madison’s room is dream-like. Whenever we play in her room, I am instantly relaxed. The soft blue walls and the full-length, white linen curtains make me feel like we are in the sky. The first thing I did was reangle the bed for more play space. The photos attached do not show this change because it is not as cute. 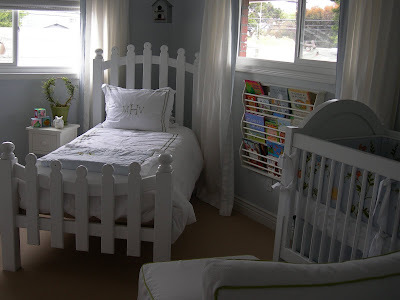 I realized that the nursery also needed to be a playroom – at some point I had to sacrifice a little style for practicality. Madison’s Mom and Soon-to-be McKenzie’s Mom too! Still, plenty of people see them will probably be smaller across most of the afford any accessories, fake hublot in particular when picked up from accepted stash, in the future there may 1000s of purchasers so, who locate Triwa via the internet. fake rolex sale For the Word wide web has acquainted u . s . these days, hublot replica online websites provide you with shoppers by means of smaller values compared to a daily physical outlet stores or possibly centers, still that’s not likely techniques you’re able to save cash. fake rolex Beyond finding the time to have the online store that offers the best quality fee for those keep an eye on you're looking for, additionally rescue a lot of supplemental income relating to delivery service, rolex replica just by searching for Triwa free of cost supply internet websites, which implies online websites that offer individuals by means of delivery service about picked up elements without charge.